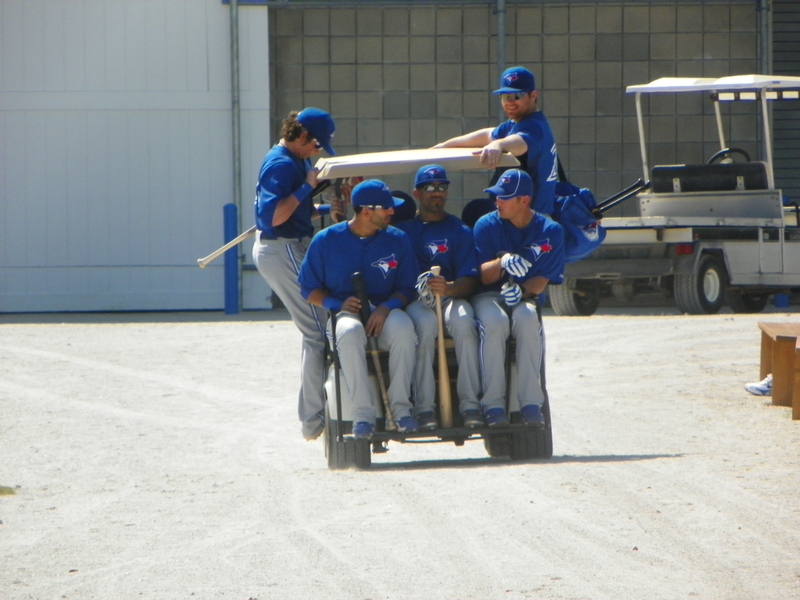 DUNEDIN, Fla.–During spring training sometimes things get a bit boring but seven Toronto Blue Jays position players beat the boredom on Wednesday in route to the batting cages. 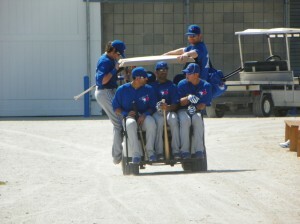 After bunting drills on the half field at the Englebert Complex seven players commandeered a golf cart meant for four and made the 50-yard trip to the batting cage. There were no reported traffic violations during the trip and it’s understood that a good time was had by all. announced Wednesday that LHP Brett Cecil with start the team’s first game of the spring against the Pittsburgh Pirates on Saturday at Florida Auto Exchange Stadium. Farrell also announced that RHP Henderson Alvarez will start Sunday’s game against the Pirates in Bradenton and RHP Drew Hutchinson will get the start on Monday in Lakeland against the Detroit Tigers. 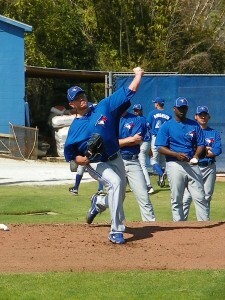 Hutchinson is a graduate of Lakeland High School and has only pitched just one game at Joker Marchant Stadium in Lakeland. That game while pitching for Class-A Dunedin of the Florida State League in 2011 was a less than stellar outing. Workouts continue on Thursday at the team’s Englebert Complex followed by a six inning inter-squad game on Friday at Florida Auto Exchange Stadium. Blue Jays Notes: SS Adeiny Hechavarria will be getting some time at second base this spring according to manager John Farrell, “But he is a long term short stop, Omar (Vizquel) is working with him but the last time he played second was when he was 15.” …According to Farrell, Hechavarria was notified about four weeks ago that he can now travel to Canada. Hechavarria signed a four year $10-million major league contract with the Blue Jays in April 2010 after escaping from Cuba. …RHP Carlos Villanueva threw in the bullpen on Wednesday but only 15-pitches to a coach. Villanueva said he expects to throw another bullpen session on Friday then throw a live BP session on Sunday. “I’m about seven days away from pitching in a game,” said Villanueva.